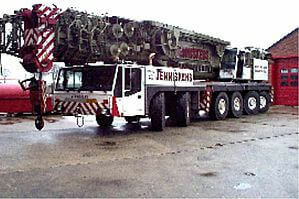 It was to be determined by investigating the drive line (engine/clutch/cardan shafts/gear unit) on a telescopic crane the causes and mechanisms for behaviors such as high dynamical torques, “engine grinding” and jumping out of gear, which often occur on this type of vehicle. The investigated telescopic crane is shown in the top figure. 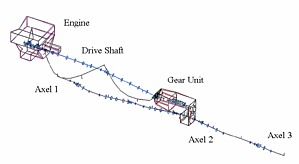 A modal analysis was performed on the stationary vehicle applying two shakers diagonally positioned towards each other on the engine and the gear unit (ground vibration test). 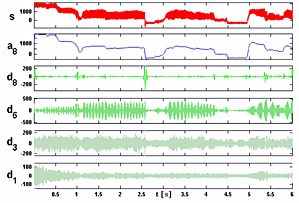 In addition, an operating vibration analysis was performed during motion. The center figure shows a wavelet decomposition of the cardan shaft torque s into the mean torque a8 and the oscillating parts d8, d6, d3, and d1. This showed that the vibrations strongly depend on the static load as well as on the motor speed. The largest magnitudes are observed in the mean frequency band (d6) due to resonance vibrations of the gearbox at 18 [Hz]. This resonance caused damages in the synchronization and lead to jumping out of gear. This phenomenon could be prevented by softer gearbox suspensions. Furthermore, the influence of insufficient clearance of the motor suspensions could be proven. Fading-out vibrations of the motor (d8) excited the regulator rod and caused “engine grinding”. FEA simulations show that a coupled bending / torsion natural frequency of the cardan shaft at 83 [Hz] (bottom figure), is excited to strong resonant vibrations by the EO2 of the cardan shafts’ force / torque at a speed of 2490 [min-1]. This was confirmed during the operating vibration analysis by a steep rise of the cardan shafts’ bending near the maximum speed of 2300 [min-1]. Applying a stiffer motor clutch, this coupled bending / torsion natural frequency can be raised to 92 [Hz], which strongly reduces the influence of this resonance in the high speed range.